Many of today’s applications attempt to connect mobile users with resources available in their immediate surroundings. Existing approaches for discovering available resources are either centralized, providing a single point of lookup somewhere in the cloud or ad hoc, requiring mobile devices to directly connect to other nearby devices. 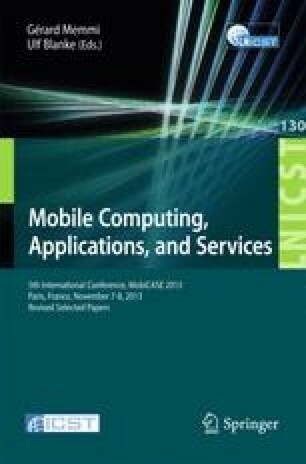 In this paper, we explore an approach based on cloudlets, marrying these two approaches to reflect both the proximity requirements of the applications and the dynamic nature of the resources. We present the design and implementation of a cloudlet-based proximal discovery service, solving key technical challenges along the way. We then use real world data traces to demonstrate, evaluate, and benchmark our service and compare it to a completely centralized approach. We find that, in supporting highly localized queries, our service outperforms the centralized approach without significantly affecting the quality of the discovery results. This work was funded, in part, by the National Science Foundation, Grant #CNS-0844850 and a Google Research Award. The views and conclusions herein are those of the authors and do not necessarily reflect the views of the sponsoring agencies.